there have been alternative technologies. Each has its pros and cons. Here are some pool alternatives you might want to explore if you have or plan to have a home swimming pool. 1. Saltwater: A saltwater pool system uses sodium chloride in a naturally occurring cycle to keep your pool clean. Chlorine is present, due to the off-gassing of the salt, but it’s far less than in a conventional chlorine pool. 2. Ionizer: An ionizer (so called) uses the mild antibacterial properties of copper and sometimes silver ions to keep your pool clean. Little if any chlorine has to be used. 3. UV/Ozonation: Ultraviolet can be used to keep bacteria down, or UV can also be used to generate ozone to disinfect the pool. A small amount of chlorine will probably be needed to provide a residual disinfectant. 4. Sonic cleaning: Using a machine that produces ultrasonic waves in the water, algae is destroyed at a cellular level. 5. 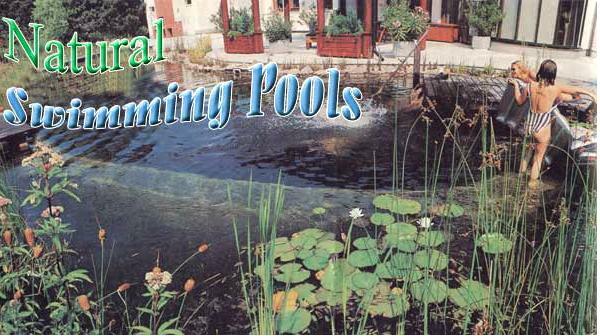 Ecosystem: You can have a totally natural pool by using plants and a breathable bottom. According to MotherEarthNews.com, a pool can be constructed for as little as $2,000 if you do it yourself, while conventional pools can cost tens of thousands of dollars.